In the crowded and competitive non-profit sector in Park City, Arts-Kids needed to better communicate that it is not just another of many local after-school arts programs but rather a profoundly unique experience benefitting children whose home, school or personal lives are being stressed in ways that may keep them from realizing their full potentials. In the non-profit sector, where marketing dollars are precious and few, what graphic identity, then, can effectively and efficiently communicate Arts-Kids’ unique proposition and thereby improve awareness, appreciation and preference for the organization in the community? 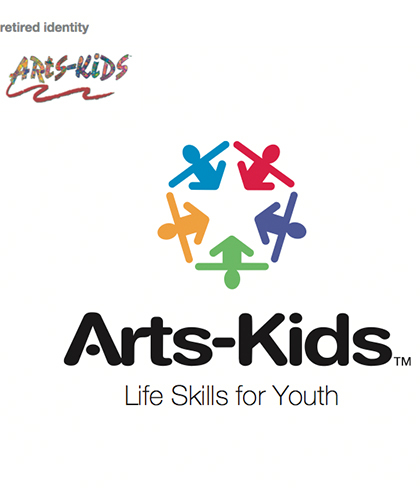 The new soft, colorful logo heralds the importance of the group circle as the cornerstone of the Arts-Kids process—a vehicle in which each child comes to express him- and herself while respecting both other children and the group as a whole. The identity, and the clarified positioning strategy behind it, has served to clearly differentiate Art-Kids from other Park City youth art programs specifically, and non-profit organizations generally.